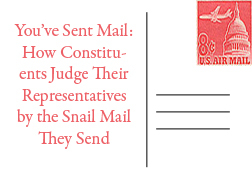 Every year, House Members collectively spend approximately $23 million to $25 millionon postage for “snail” mail sent to constituents. They spend millions more on paper, printing, and design. A small portion of this mail sent via the USPS is mailed in response to constituent correspondence, but most of it is proactive, unsolicited mail sent to the district’s residents. It is fairly common for Congressional offices to budget at least $100,000 per year for proactive mail, and while some offices spend less than that (or nothing at all), there are those that spend far more. This report is designed to be a first step in helping guide Members of Congress tomail smarter and more cost-effectively—particularly given the financial constraints Congress is imposing on itself. While extensive in its findings, this report is meant as a starting point for research on the question of mail, not the end point. One critical consideration related to this topic is that printed mail, sent via the USPS, competes with other forms of communication that have gained wide acceptance in our society in recent years. E-newsletters, Facebook, Twitter,and tele-town halls are among the newer forms of outreach to constituents, and these vie with printed mail for the attention of increasingly distracted constituents. This puts an added onus on Congressional offices to not waste taxpayers’ money, and to send snail mail that can break through the clutter ofmedia-generated messages that constituents have to sort through every day. The increasing competition for constituents’ splintered “mind-share” may accountfor a consistency found throughout the survey results cited in this report: A clear majority of constituents say they are not very likely to read any given piece of Congressional mail sent to them. And these constituents’ concern about finances and how government money is spent drives a related opinion: Congressional mail pieces are not a very good use of taxpayers’ dollars. This critical look at Congressional mail should serve as yet another wake-up call to Members that their constituents expect them to spend their tax dollars more wisely. As important, this study serves as a blueprint for helping Members do just that. 1) When in doubt, keep it brief. To get mail read more often by constituents, rely on modest-sized postcards and one-page letters. 2) Constituents hate homework; don’t say it in two pages if you can say it in one. 3) Over-sized mailings raise constituents’ ire. 4) Mail pieces soliciting constituent feedback are better regarded than mail pieces that merely inform. 5) Make sure mail pieces pass the “smell test”: Could they plausibly be confused with campaign literature? 6) Constituents are skeptical; cite sources for your facts. 7) Don’t skimp on quality in the name of fiscal discipline; save money by mailing smarter. 8) Older constituents are more likely to actually read what you mail—be kind to them and ditch the small font sizes. 9) Constituent service is important, but don’t send an entire mailing about one specific service to the entire district. 10) Finely-targeted proactive mail allows Members to tell a nuanced story to key audiences that might otherwise be overlooked. 11) The younger the constituent, the less bothered they are by the concept of targeting. A list of “Best Practices” follows the report. This is the latest of the Congressional Institute’s study on improving communication between Congress and its constituents. Follow these links for our reports on the effective use of e-newsletters, harnessing new communications technologies, Congressional Facebook pages, Congressional website and e-newsletter design, and Congressional tele-town hall meetings.